I wanted to use my first post to welcome one of our national symbols to the folds of nanoscience! 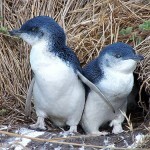 Say hello to Eudyptula minor, Korora in Maori or the Little Blue Penguin to its friends. These quirky little critters have just been shown, by a group from Yale and Akron Universities (sadly without any Kiwi institutions contributing), to have some some seriously spectacular feathers. The feathers on their backs that give them their distinctive ‘Blue’ colour achieve this with a combination of pigmentation (like our skin and hair) and nanostructured cylinders. You see, the wonderful thing about nanoscience is that it works with structures smaller than the wavelength of visible light. So what? Well, that means, amongst other things, that trying to ‘see’ these things by looking down a high powered microscope is largely pointless as they don’t just reflect or absorb light like normal – they manipulate it! 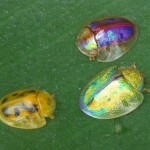 In a biological sense this is to reflect certain wavelengths (colours) that allow for plumage, and you can also see this trick in the iridescence of butterfly wings and beetle shells. 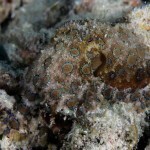 It is also partially responsible for how octopi appear to change their skin’s colours and textures. 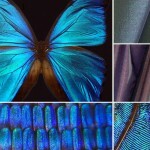 Nanotechnology is what makes them blue AND shiny! What’s cool about the Little Blue’s incarnation of this technology, however, is that they combine this with the ability to completely shrug off water. 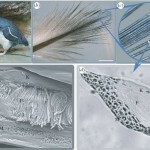 Their feathers are ‘hydrophobic’ (possibly superhydrophobic – although it’s a little hard to do a contact angle experiment to confirm this on a penguin!) due to by a combination of the oils their feathers produce and the particular type of keratin that these wicked feathers are grown from. 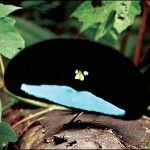 We’ve actually only been aware of this phoenomena in natural systems for just over a decade and so doubtless there are more examples of this technology waiting to be discovered by enquiring minds – and it’s not limited to making things shiny either! 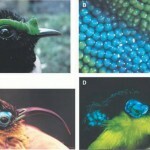 The Yale group has also shown that the hue of the skin of several birds, originally Broadbills from Madagascar, is also controlled by the formation or tiny nanostructures that manipulate light in a subtly different way. With April being the International month of Astronomy, celebrations are just getting into gear! 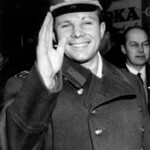 Most kick off this week with Tuesday the 12th marking the 50th Anniversary of Yuri Gagarin’s first manned flight into space. That sentence is pretty innocuous by itself but take a moment to consider what that feat actually entailed. The FIRST homo sapien to brave the ‘Edge’ of space, over 100km above the ground, in 1961, in a flight that took only 108 minutes to orbit the earth. 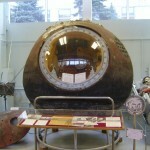 Oh and it was in the tiny capsule pictured: the Vostok. Read more here or take a look at his face to understand some of the magnitude of that achievement! So! this is being celebrated at Observatories all over the country, but particularly at Carter Observatory in Wellington and at Stardome in Auckland both of whom are showing the new film “First Orbit” documenting Yuri’s historic trip. This also ties in with another big Astronomy event: the launch of the Kiwispace Foundation! Kiwispace is composed of a group of Kiwis looking to ignite the New Zealand space industry and education network. As a new foundation they are still looking for members and collaborators from all walks of life and this is a wicked opportunity to get involved! Currently we’re also working on developing a space education programme for both Primary and Secondary schools and we are also intending to launch a weather balloon to the edge of space by the end of the month. Although this has been done before, it has seldom been successful over a country with as little landmass as NZ so we may have to wait for the weather to play ball before we can complete the launch. So if you’re interested sign up, and get involved! No experience necessary, the only requirements are passion and enthusiasm. Great first post. Elf. Look forward to future ones in this vein. Gagarin’s space flight is in front of my mind too. I can still remember the excitement when the news broke. Many years later I got to see the Vostok landing capsule held at the Economic Achievement’s Exhibition in Moscow. That brought it home to me how brave the man was. The space in the capsule was surprsiingly small – but at least well padded. The outside of the capsule was burned. The exhibition also held replicas of other famous space craft. A few years later I also got to visit the Air and Space Museum in Washington. Again with all the equivalent US replicas.